This subject has been one of much local interest over the years, a testimony to the town’s appreciation of its past and perhaps to its fascination with railroads as well. The purpose here is to add a few details and tie things together in conjunction with the history of Danbury's railroads on Track 10. Please see references there beyond what will be documented separately here. 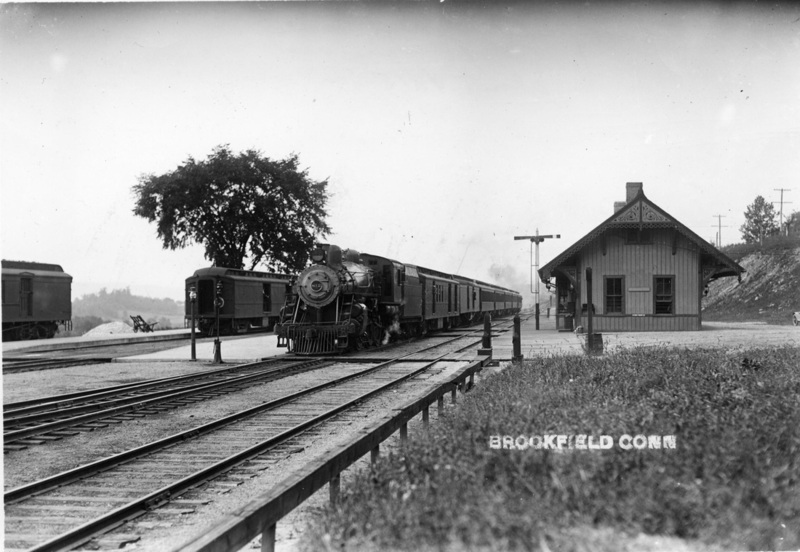 The Brookfield Museum and Historical Society [click here] has a fine collection of maps, newspaper clippings, artifacts, and other materials for those interested in delving into Brookfield’s railroad history. 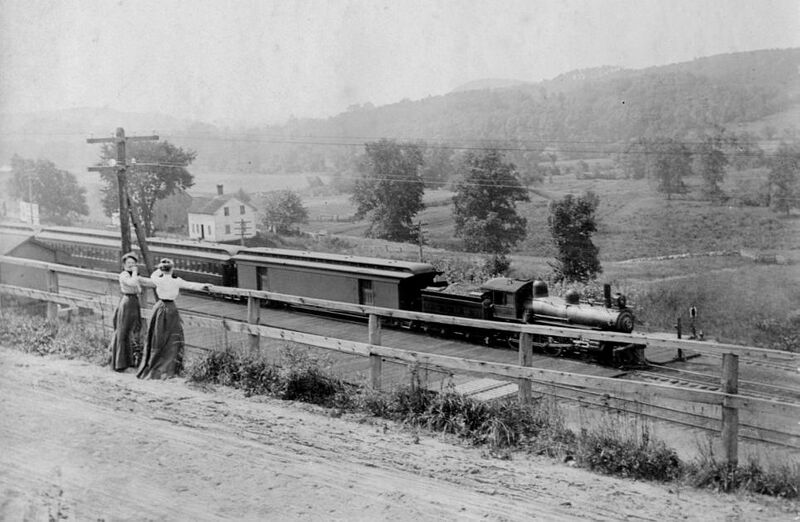 [9.1] Brookfield first became a railroad stop in 1840 with the opening of the Housatonic Railroad. The BROOKFIELD1 station was located in the Iron Works or Four Corners district. 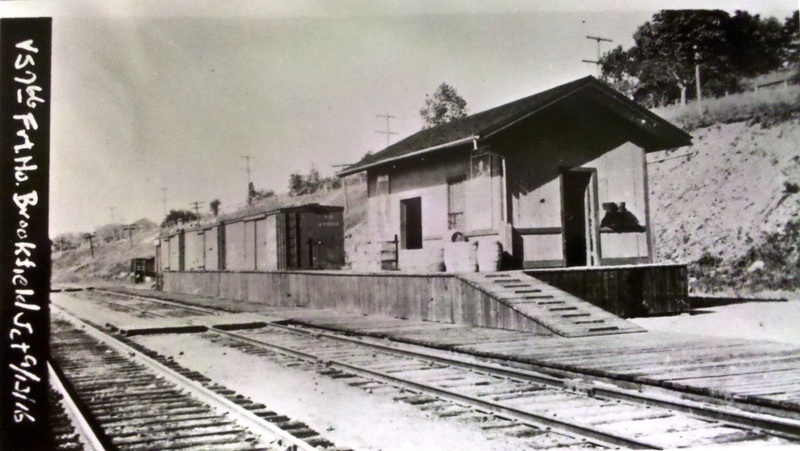 It was a combination depot for both passengers and freight and the town’s sole rail stop until 9/24/1868. On that day, the New York, Housatonic and Northern RR opened 5.5 miles of track and began running trains to Danbury from a connection with the HRR that was soon dubbed Brookfield Jct. The NYH&N never got to its intended terminus at White Plains but the connection to Danbury made the junction a busy place to catch HRR trains south to Bridgeport and New Haven and north to Pittsfield and Albany. The traffic created enough business for a hotel, which was built here opposite the station and stood until it burned on 9/10/2006. Initially Brookfield Jct. had a “large tree” for a depot, according to James Montgomery Bailey’s History of Danbury. 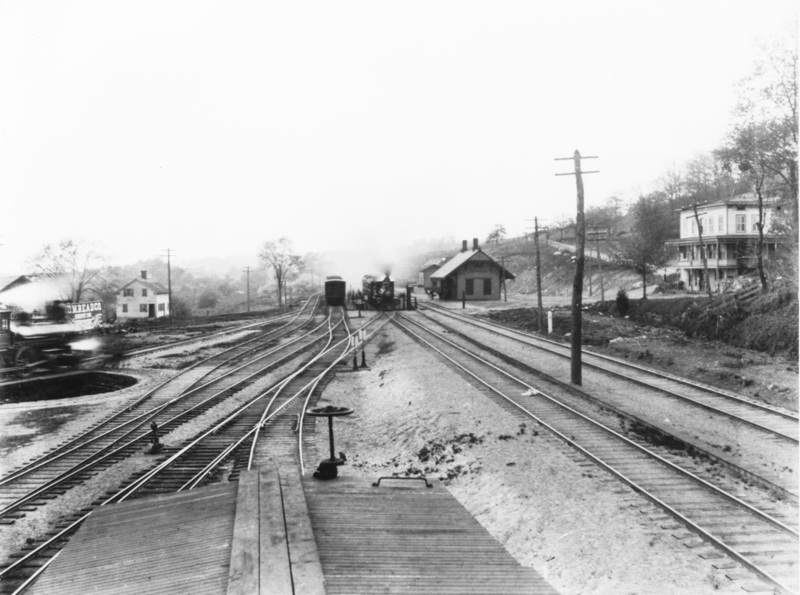 Late in 1869, the HRR dismantled its 13x30-ft Stockbridge, MA station and reassembled it here to serve both railroads as BROOKFIELD JUNCTION1. That situation remained unchanged until 3/17/1889 [DN/03/18/1889/03; HC/03/20/1889/06]. 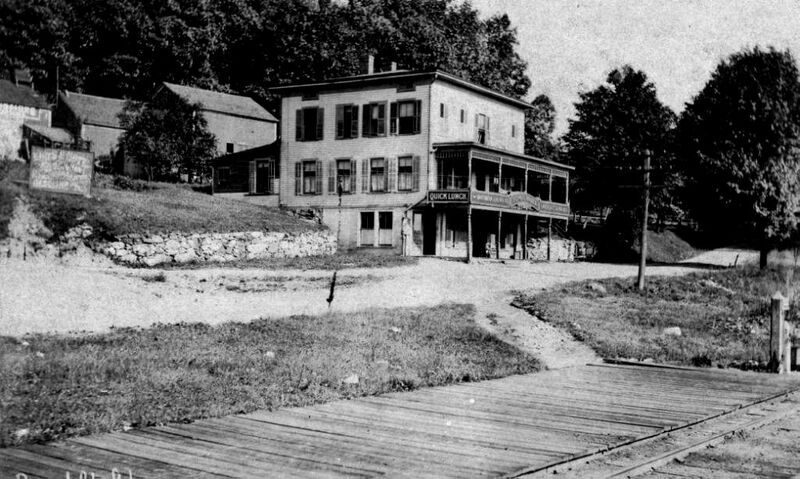 At that time, the HRR, which had leased the NYH&N in 1872 and purchased it in 1882, reconfigured its tracks in the Hat City so as to make DANBURY4 superfluous. That station was lifted and moved here on flat cars to become BROOKFIELD JUNCTION2. 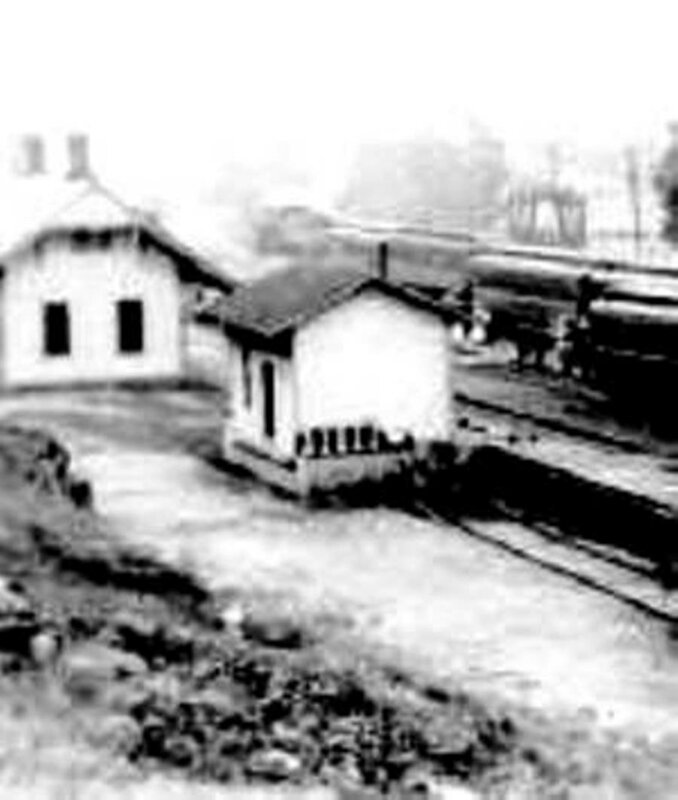 See Track 10, MP 10.6.1., with the first station becoming the freight depot: see Track 12. [9.2] The engine is NYNH&H #812, superheated by 1913, but Charlie Dunn says the smoke box is still the shorter version. The locomotive was rebuilt in the mid-1920s with a new frame and longer smoke box. Charlie also notes that the 812 was the last NYNH&H steam locomotive to leave Grand Central Terminal when the switchover to electricity took place in 1907. Richard Fleischer adds: "The steel baggage and steel baggage-RPO cars were delivered in 1914-1915. And Number 812 did not have the electric headlight required by the ICC to be installed on engines built before July 1, 1918, at the first shopping after July 1, 1918, or before July 1, 1920. So this photo would have to be from 1915 at the earliest to 1920 at the latest." There were [Lord, p. 58, see below] reportedly 40 trains per day passing through Brookfield Jct. 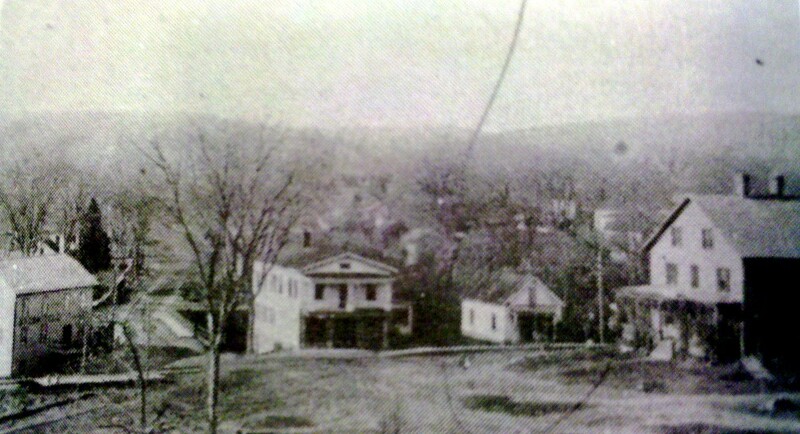 in the early 1900s. [9.3] This photo is a real gem. Though it is not the focus of the shot, there is an engine steaming on the turntable in the middle left. It has been suggested that the only the engine is blurred because it was perhaps being turned as the shutter was closing in a timed shoot, and that the darker shadows ahead of the engine may be ghost images of the crew turning the engine. The lettering on the sign behind the engine says D.M. READ CO. BRIDGEPORT CONN. The bottom line says DRY GOODS, superimposed over what appears to be a dragon motif. Read's, as most of us called it, was a long-time Bridgeport retail institution, founded in 1857 and lasting until 1995. Click here. The advertising in Brookfield, on what appears to be an early billboard, is a testament to its good merchandising instincts as well as the fact that the HRR line, now part of the NYNH&H, could take passengers to the Park City for shopping. Our clever photographer is apparently on the the top of a boxcar, the roof and brake wheel of which are seen at the bottom of this fascinating shot. We think this dates to the 1890s with what appears to be a coupling link on the front of the engine at the station. An added bonus is what looks like a Dutch clock, a timing device to keep trains from following too closely, to the right of the engine at the station. These were used by the HRR and also by the NYNH&H. [9.4] By 1892 the New York, New Haven & Hartford was in control of most of the state’s railroads, including the HRR. Under the new owner service to points north and south remained much as before. By 1898 the NYNH&H also had taken over the New York & New England RR, which had built via Hawleyville to Danbury in 1881, along Brookfield’s southern border. This had created a triangle of rails between Brookfield Jct., a point southeast called Hobarts and a point southwest going toward Danbury that would come to be called Berkshire Jct. The NY&NE was double-tracked starting in 1906 and the old HRR line that paralleled it from Hawleyville to Hobarts was eliminated. In a subsequent project to increase capacity northward, the contracting firm of Holbrook, Cabot and Rollins began work on double-tracking the line from Berkshire Jct. to New Milford on October 1, 1909. With a force of 200 men working 60 hours per week, expectations were to finish by January of 1911. A 25-ft deep, 600-ft long rock cut just below Brookfield Jct,, described as a "small edition of the now famous Culebra cut on the Isthmus of Panama," was blasted with dynamite to eliminate a curve and save a quarter of a mile in track distance [NHER/07/02/1910/03; RRC18:297 (2/2/1910)]. The line was also relocated slightly eastward in the project that was intended to improve gradients, increase tangents, and eliminate grade crossings. Bridges like the ones at Junction Rd. and the one over the tracks at Rte. 25 were put in at this time. 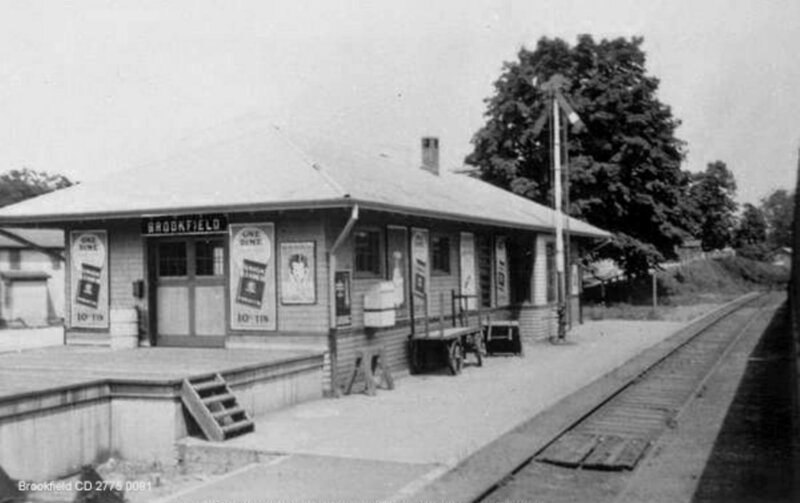 Interlocking station #199 at Berkshire Jct. 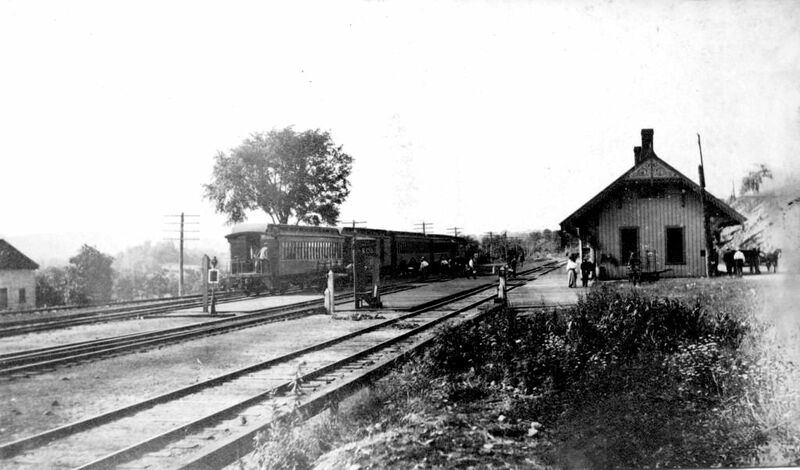 was put in service on 3/15/1908 and the double-tracking to Brookfield Jct. was finished by 5/7/1913 [NHRTIA Data Sheet 12.S.S.198/199] The store-front BROOKFIELD1 was replaced in 1914 by a new combination depot, BROOKFIELD2, the structure that survives today as part of the Craft Center. 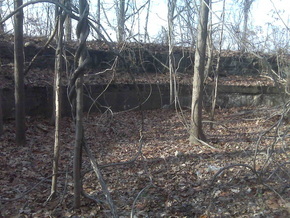 [9.5] This is the structure that served as the first Brookfield Jct. station. 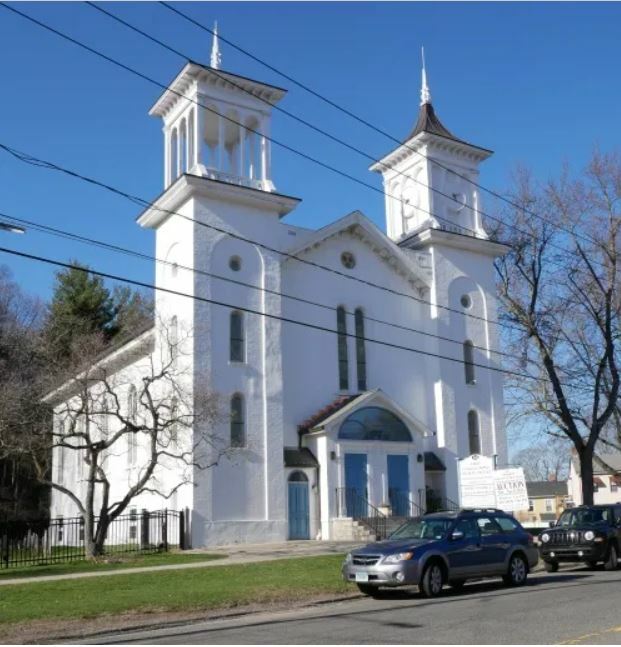 It was brought down from from Stockbridge, MA by the HRR late in 1869 and reassembled here for the use of both the HRR and the NYH&N [DT/11/18/1869/02; DT/12/02/1869 /03]. It was said to measure 13x30 feet. In 1889, the Newtown Bee tells us that it was to be "moved to the west, across the branch... [to] serve as a freight depot" when the HRR's Danbury passenger station was moved here [NBE/04/05/1889/02]. See Track 10, MP 10.2.7 for more. [9.7] NYNH&H #504 being turned on the Brookfield Jct. turntable. This engine was formerly HRR #54 until renumbered as #504 in 1892 and as #1411 in September of 1904. 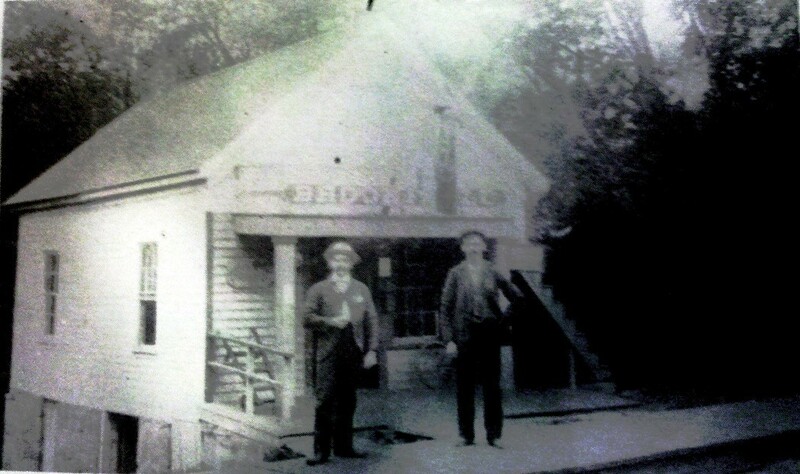 The photo is thought to be closer to the 1904 end of the date range. 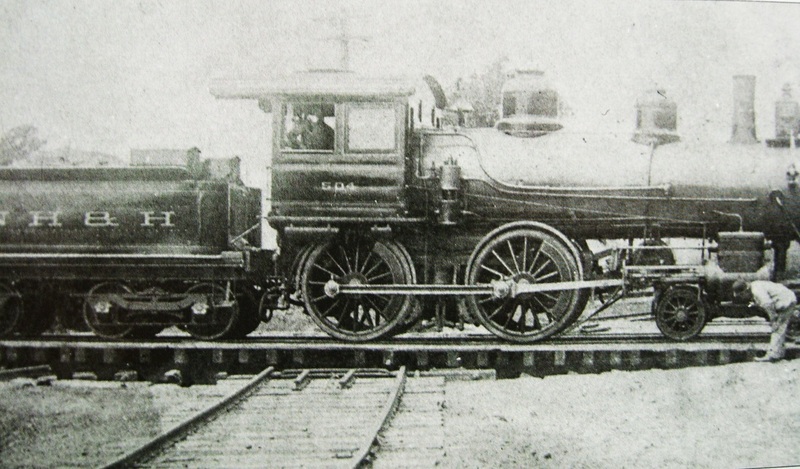 Interestingly, this was Phil Blakeslee's engine in the Allingtown siding accident of 1907. See Track 4, MP 4.37-4.38. Apparently it was repaired and put back on the road again, even though the newspaper said the fronts of both engines were smashed in as if they were putty. This engine ran until it was retired on February 1, 1924. [9.8] A view from Stony Hill Rd. a little north of the station. Brookfield Junction1 is seen as the freight depot this side of the passenger station. The considered opinion here is that the date range for this scene is 1905-1913 and probably closer to 1910 based on the engines and consists. The nearer engine is a 4-4-0 and the farther one a G-4-a 4-6-0. [9.9] This shot is north of the station but a little closer to it and from a somewhat different angle than the one just above. Here you can see the end of the wooden-plank platform, about even with the front of the locomotive. The cut-off building at the left has to be the freight depot. The billboard in the upper left may be the same as in the turntable shot above, possibly even with the same D.M. Read advertisement. The four-windowed white house also corresponds to that view. A closer look at the lettering on the tender shows it reading NYNH&H and it is probably a three-digit number on the engine. The consensus dates this shot to ca. 1905, with the ladies' outfits corroborated in a Sears catalog of that time. [9.10] Freight service is provided today through Brookfield via a HRR reincarnated in 1983 and there is talk of extending Metro-North passenger service from Danbury to New Milford. 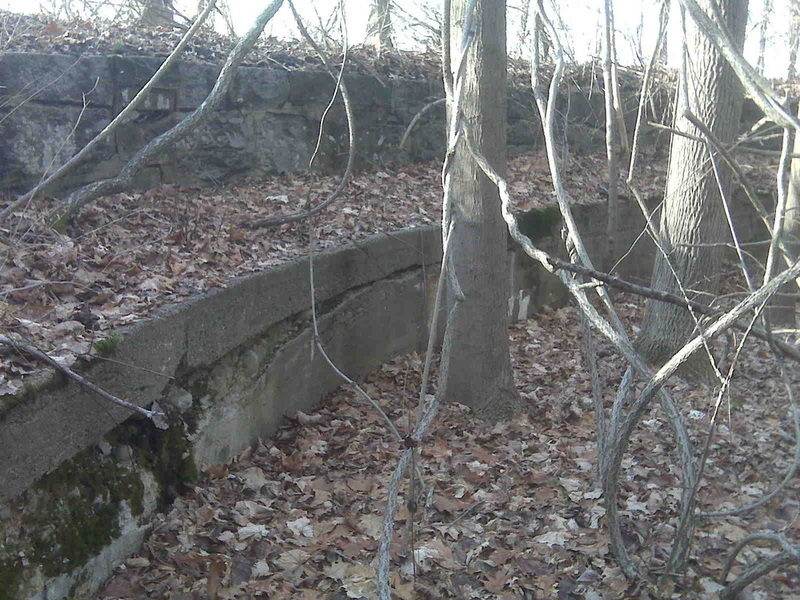 Vestiges of the older days remain: the turntable pit and station curbings at Brookfield Jct. 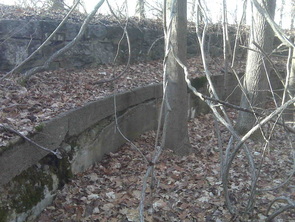 opposite the site of the old hotel on Stony Hill Rd near Sunset Hill Rd., the 1840s square-cut stone culvert opposite Pepsi on Pocono Rd., and traces of the line to Hobarts along Stony Hill Rd. going south from Junction Rd. Additionally, the gully between the track and the old culvert appears to be the former roadbed, unused after the 1911-1913 relocation. [9.11] The hotel, which stood across Junction Rd. from the railroad station, is shown here in this ca. 1900 shot. 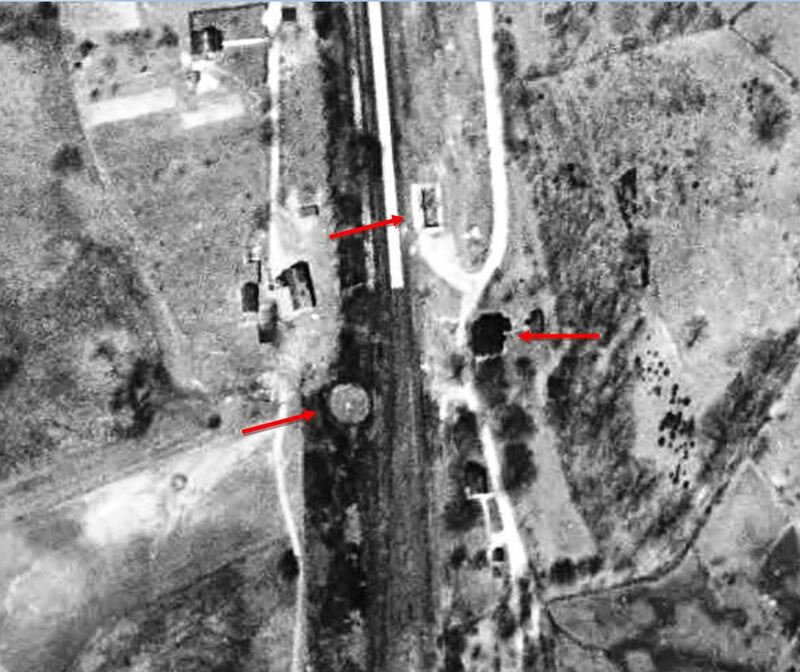 Note the planked platform along the railroad track in the lower right. The hotel had rather a colorful history of its own in its 130-year history, including upstairs 'entertainment' and the suicide of one of the owners. The hotel burned in 2006 and the site Stony Hill Rd. site still remains vacant. [9.12] Another view looking north at BROOKFIELD JUNCTION2, probably from just beyond the hotel, which is on the right, and the turntable to the left. The white house is a familiar point of reference. [9.14] This is the box culvert on Pocono Rd. opposite the Pepsi distribution center. 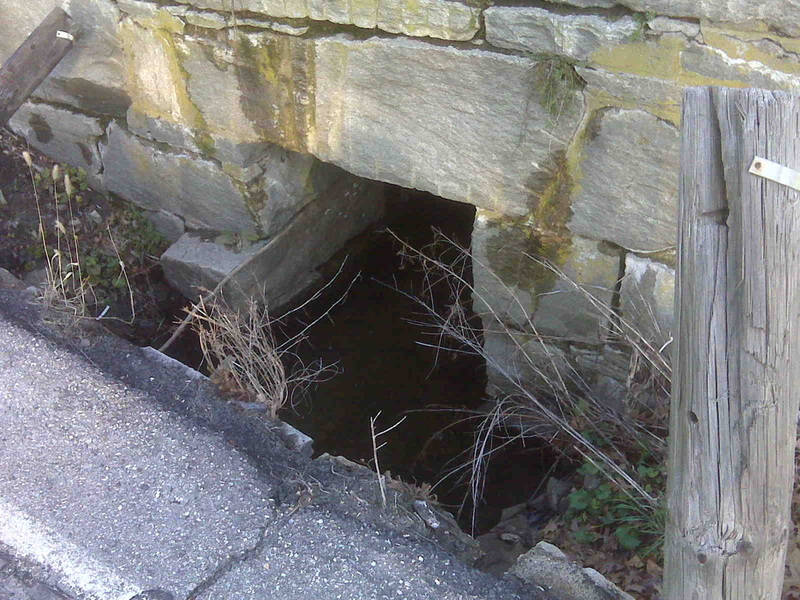 This simple, sturdy style of culvert is typical of those found in the original construction on the HRR and other early nineteenth-century railroads. [9.15] These two recent shots are of what's left of the Brookfield Jct. 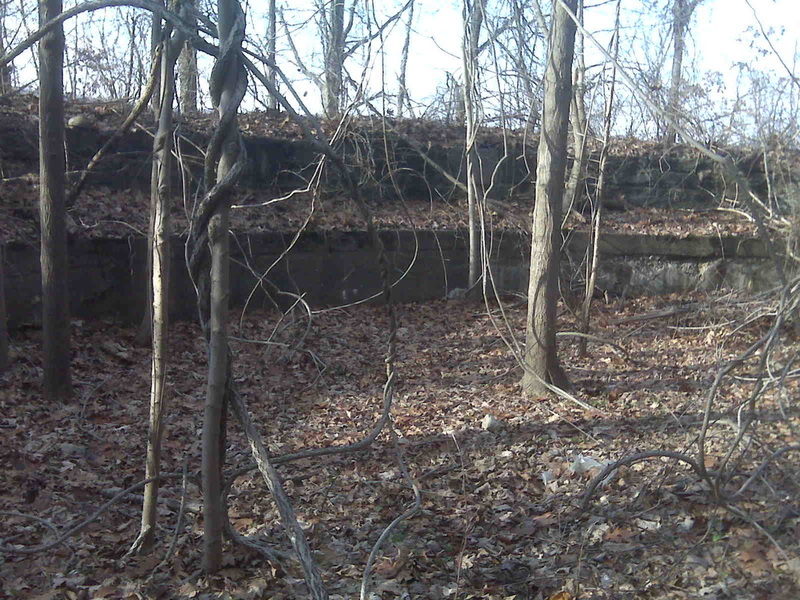 turntable pit, where engine #504 (above) was being tended to. The location is off Stony Hill Rd., near Sunset Hill Rd. and along the active track of the reincarnated HRR. 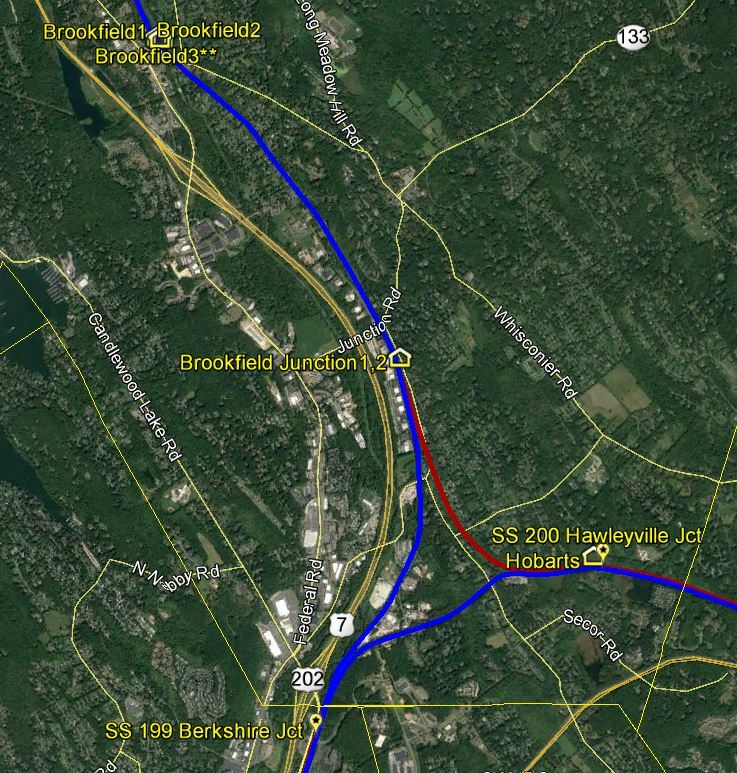 [9.17] Brookfield Jct. station, ca. 1932, looking abandoned but still in good shape. Passenger service ended in 1925. The hotel, pictured above, must be out of sight to the left over the top of the station, probably behind the foliage that has grown up. See the aerial photo above at MP 9.13. For some reason, the station appears now to have only one chimney, perhaps due to some reconfiguration of the heating system in its later days. The two chimneys are seen in the other photos on this page. [9.18] This snippet from our Track 11 Google Earth map shows the area.